April 4, 2016. Those last two shots. First, the acrobatic, game-tying 3-pointer from the University of North Carolina’s Marcus Paige with 4.7 seconds left — a shot of a lifetime. But what came next is eternal. The inbound went to Villanova’s Ryan Arcidiacono, who ferociously made his way up the court. His trailing teammate, Kris Jenkins, called out his name, caught a scoop pass from Arcidiacono behind the 3-point line and let it go. At the buzzer, with the red light illuminated around the game clock, the basketball dropped, a dagger in the hearts of North Carolina coaches, players and fans. Game over. Villanova was the new national champion. That night featured a matchup between the country’s most talented team, No. 1 seed and East Region champion UNC, and the tournament’s hottest team, No. 2 seed and South Region champion Villanova. The Tar Heels ultimately fell short of their sixth NCAA title, while the Wildcats claimed their second championship in program history, and first since 1985. With nine ties and nine lead changes, the game was a 40-minute chess match, though we really only remember its final seconds. “Clearly, I’m biased, but it’s the best ending in NCAA history,” says Arcidiacono. “The last 15 seconds or so was probably more ridiculous than any other final.” The last 13.5 seconds, to be exact. A year has come and gone, yet the memory the 2016 national championship is fresh. UNC is making a redemptive return to the Final Four of the 2017 NCAA tournament, and on the other side of the bracket, Villanova’s run toward a repeat came to a premature end with a second-round exit. So, during the South Region final, Villanova’s Jenkins sat in the crowd supporting UNC’s Nate Britt — his adoptive brother since middle school and national title opponent in 2016. After the Tar Heels advanced to their second-straight Final Four — in game-winning fashion eerily reminiscent of how their last tournament came to a screeching halt — reporters found Jenkins with a UNC Final Four cap on his head. They asked him about April 4, 2016. UNC players, still chasing the ghost of Jenkins’ shot, got the questions about that night, too. Almost every day of their lives, those who shared that court in Houston still relive the game’s final seconds. For both sides, even the champions, it’s been difficult to move on. In early March, before the start of the 2017 tournament, we spoke to all of the players on the court at the end of the 2016 title game, as well as both coaches, and Grant Hill, who was courtside between fellow in-game analyst Bill Raftery and play-by-play guru Jim Nantz as part of the Final Four commentating team. All were open about what’s still an emotional roller coaster for everyone. The ending of 2016’s national championship was, and remains — in its purest form — what March Madness is all about. Everyone quoted is identified by the titles they held during the 2016 national championship. With 5:29 left to play in the game, the scoreboard read, Villanova 67, North Carolina 57. The Tar Heels, consensus 2.5-point favorites heading into the night, were on the ropes. But by the time Josh Hart hit two free throws with 13.5 seconds left, Villanova’s lead was a mere three points, 74-71. Villanova head coach Jay Wright called a timeout. A national title was on the line. We were really talking about how we were going to defend their attempt to get off a 3 and tie. About the fact that they’re gonna go to Marcus Paige. We’re gonna switch the screen on Paige. Make him back cut … go behind the 3-point line. We can’t let them catch and get a 3. The play coach drew up was one we run a lot. The plan was to screen to get me the ball back on the right wing … basically for me to just act like I was going away from the play and then come back off the screen to get the ball. But Villanova came out and switched everything, one through five. The center switched out on me, and it didn’t look like it was going to be anything. They actually almost got the steal. That was the reason I got the shot. We executed perfectly. Ryan Arcidiacono was on Paige. Daniel Ochefu’s man set a screen, and Daniel switched just like we wanted to. He was in such perfect position. Right in line to steal the pass. He went to steal it, and fell down. We did what we were supposed to do. The poor kid just falls down. I definitely thought I had the ball. I was going to grab it, and I thought I was going to have like 0.5 seconds before I could just chuck it downcourt. 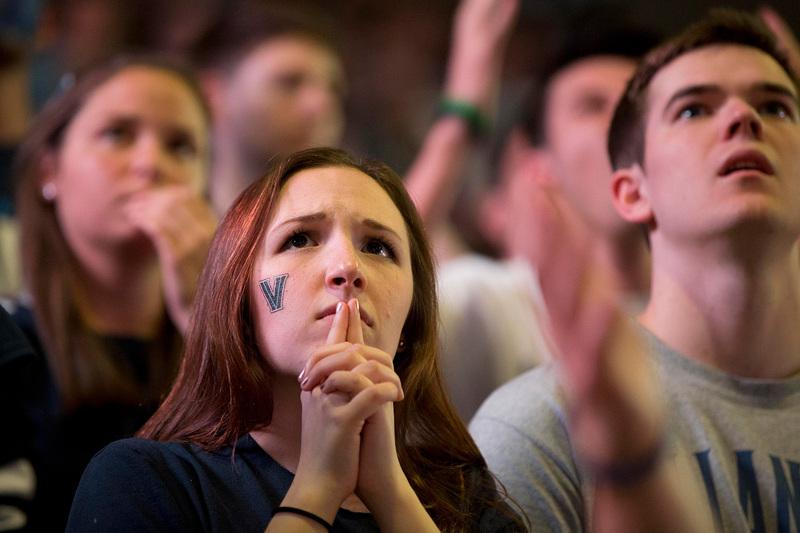 Villanova basketball fans view a broadcast of the national championship between Villanova and North Carolina on April 4, 2016, in Villanova, Pennsylvania. It seemed like it was almost a wasted possession. Carolina came down, and they just weren’t precise. They got a little sloppy … and you thought, ‘Wow, Villanova was going to play such good D that they weren’t going to allow Carolina to get a good shot off?’ Ball is all over the place. Clock is getting low. Then Paige goes up. I saw him. I sprinted towards Marcus because it’s a no-3 defense. I tried to make him change the trajectory of his shot and he did. I think I did a good job of it, but we all know what happened. When Ochefu missed the steal, I kind of regathered the ball. I knew I was going to be open because I was his assignment. Then Ryan tried to run me off the line … just ran by with his hands up. Once I lifted, I had to readjust and get my hand back under the ball. Once I set the ball, I had to bring it back down and reset. And then my legs … going all over the place. I think that was just to maintain my balance. The focus. The will. You see how Arnold Palmer willed the ball into the hole. I think Marcus willed that ball to go in … the way he had to contort his body. He was in the air looking to pass, then he shot it? It was tough. When he went up and double-pumped, when it left his hand, you’re not thinking that’s going in — and it went in. An unbelievable shot when his team needed him. We were so desperate at that point. We were down 10 — we honestly thought the game was over. Coach kept on telling us … we’re still in the game. Next thing you know, we’re down three and then Marcus hits that shot. We’d seen him hit shots like that before. Of course it was exciting to see him tie the game. And, yeah, it’s definitely one of the greatest shots I’ve ever seen. Ever been a part of. But that’s the type of player he is. That’s the type of person he is. Always full of surprises. Honestly, I was stunned. I didn’t have like a ‘Oh, my, goodness! I can’t believe he just hit it.’ It was more of, ‘OK, I don’t know what to really think.’ Coach called a timeout and that’s when it really hit, that we just tied the game up in the national championship — that we have a chance to win. I was kind of in shock at first. It felt like we were going to overtime. I thought there was going to be an overtime. I wasn’t sure Villanova could make a quick play like that, full length of the court, in a very short period of time. Going through my mind was, ‘Timeout, next play.’ We still had time to win. If there’s time on the clock, we’re going to fight to the very, very last second, you know? We had the last possession. Marcus Paige’s circus-shot 3-pointer tied the game, 74-74. Michael Jordan, a Tar Heel before he became the GOAT, pumped his fists in the air among a crowd of fellow UNC basketball legends, including Vince Carter, Antawn Jamison, Raymond Felton, Danny Green, Harrison Barnes and Kendall Marshall. Jay Wright called another timeout, his third in the final minute of the game, during which Villanova players and coaches repeatedly recited their team motto — “Attitude” — to each other. They were calm as they prepared to run one last play. It’s called “Nova,” a scheme they practiced over and over throughout the year. To ensure that it ran smoothly, out of the huddle, Daniel Ochefu snatched the mop from the ball boy to clean up the trail of sweat he’d left on the floor while diving for the steal moments before. When Villanova lined up, Grant Hill recognized the play from his NBA days. Unlike North Carolina, he knew what was coming. Everybody was going crazy. The crowd, our student section, they were throwing those championship seat cushions. It was pretty cool, but then coach started screaming at us and that refocused the mood. ‘Just gotta get one stop!’ We had the momentum, so all we had to do is get that one stop, and we liked our chances. Our major concern when we called the timeout was to make sure no one was shaken by Paige’s shot, no one was worried about having made a mistake. Everyone did what they could do. We wanted to get past that and get onto the next play. Can Carolina get one stop? What will they do? What was Villanova going to do? Were they gonna try to throw the ball to half court and get some momentum? I wasn’t sure. They knew what we were going to run, so I just said, ‘You know what? Kris, take the ball out. Arch, you stand right here. Daniel, you start here. Booth, you start here. Josh, you start here.’ Then I drew it up slowly, but they all knew. ‘Enter the ball to Arch. Daniel, set the screen for Arch. Josh, you screen for Phil. Kris, you trail.’ It was just kind of going through the motions, because everybody knew what we were going to do. It was something we’d practiced every single day for like the last four years. We all knew I was gonna have the ball in my hands to make the decision of what was going to happen. Either I would shoot or find someone for a shot. Daniel locked eyes with me the whole time. Villanova went offense for defense for the final play, subbing in Phil Booth for Bridges. I was looking at everybody’s faces. Coaches, players — we were all ready to do what we do. I told Arch when we broke the huddle that I had a chance to be open, because they’re not going to put anyone on the ball when I take it out … I knew that if I got in his vision, I was able to get close enough to him to call his name and he could hear me. As he took the ball out and threw it to Arcidiacono … when Archy took his first couple dribbles, it reminded me of a play in Detroit we used to run with the Pistons. I was like, ‘This is the play we used to run in ’96-’97!’ I saw it all happening, and if you listen to the call, I even said, ‘Watch Jenkins.’ Somehow I managed to get that in there before the play happened. Once I crossed half court, I saw Kris out the corner of my eye. Just instinct, honestly. I saw they kind of stepped up on me and he would have a pretty deep NBA 3, but I trusted him more than probably anyone. I wouldn’t want anyone else to shoot it, and we all know what happened. He made the perfect pass. We had the perfect sight line. It looked good from the moment it left his hands. I thought it could’ve been a little long. Everything was kind of like in a trance for a little bit. I was feeling pretty good when it left his hand, for sure, though I was a little bit like, ‘What the hell! I definitely told Arch to shoot the ball, like 50 times, and he didn’t shoot the ball.’ But then as the ball was going up, I was like, ‘Oh, it’s Kris.’ Every time Kris shoots, I think it’s going in. I saw the pose he did at the end when he landed. Most times when I see him do that, he hits the shot. I think every shot I shoot is going in, whether it’s an air ball or on the other side of the backboard. When I shot it, I leaned forward because Hicks was in my vision after I shot the ball. When I leaned forward, I knew that it was going in, for sure. On the bench, we locked arms. Once Kris let go, it felt like we all knew it was going in. A lot of us started moving before it went in. It felt like slow motion. Watching it go up in the air was one of the happiest moments in my life. I literally just said, ‘Kris, gimme one.’ That’s all I remember saying. And he gave me one. After that, it was mayhem. The horn goes off, the fireworks shoot off as soon as he makes it, and it’s like you don’t even have time to process it. It just happened. When he made it I was like, in my head, ‘No.’ In my mind, I was like, ‘No, no, no. There’s more time.’ I was trying to think of some way that what just happened didn’t happen. But then you see all the guys run out past you and dive on Kris and everything. It just slowly becomes real. That’s the crazy thing about basketball. Everything can change in … 4.7 seconds. I was at peace already, whether Kris’ shot went in or not. I was so proud of how they were handling themselves. When he hit it, I thought, ‘Hey, this is God’s will.’ It could’ve gone either way. I thought they were going to put time on the clock. I thought we were going to have to get the confetti cleaned up. Everything off the floor. Then the assistant coaches jumped all over me. Roy Williams was standing right there and said, ‘I’m really hurting for our guys, but I’m really happy for you.’ I knew it was over. Three cannons shot off. Yellow, gold and white confetti fell from the sky. Kris Jenkins’ teammates swarmed him. The celebration stopped briefly, as Villanova all gathered in a single-file line to shake hands with the devastated players of UNC, before Jenkins ran to the sideline, looked into the crowd, pointed to his left forearm while yelling, “I’ve got ice in my veins!” The nets were cut down and championship hats and T-shirts were distributed. In the tunnels of NRG Stadium, inside the runners-up locker room, tears flowed in front of Michael Jordan, who hit the game-winning shot in the 1982 national championship to lift UNC over Georgetown. I don’t remember anything after the shot. I just know we lost. That’s it. I know I was crying, but after that, I really can’t remember anything. Just seeing the tears in their eyes, their slumped shoulders. A great, powerful, proud team with tears in their eyes, just slumped. They had given everything. It’s still something I can visualize, and I felt for them. I really did. And I knew that easily could’ve been us. Either team was worthy of winning that game. We get to the locker room, I’m sitting down. Everybody’s in tears, upset. I’ve got my head in my jersey and stuff. I didn’t know what was going on. The first voice I heard wasn’t coach’s … I heard Michael start talking, and I was like, ‘That’s not coach.’ So I looked up, and it was him addressing the team. Everyone was kind of surprised. That was a blur. He was just saying how he lost a lot of games before he won the big-time games. I don’t remember anything he said … I had my hands in my face. It was hard to … go along with what he was saying because he made the shot that won them the national championship. I don’t think he’s ever lost a big game in his life. You’re hearing this guy telling you it’s going to be OK. Easier said than done. Seniors, we weren’t going to get a chance to avenge that. We’re not the greatest player of all time. It was cool to meet him and everything, but in that exact moment, it was almost like, Man. That’s all I kept thinking — this guy actually got to win. He actually got to cut the nets down, but he’s saying everything is OK for guys like me? I’m not taking it for granted, but it was tough listening to him speak after the game. Inside the champions’ locker room, Villanova took in the moment, while waiting for Ryan Arcidiacono, Kris Jenkins, Daniel Ochefu and Jay Wright to return from speaking to media at the podium. Once they did, the coach offered his words. He said how proud of us he was — to not let this moment or this one game define us, because we all want to be defined by who we are as men, and not just for a basketball game. We prayed, and I told the guys, we’re going to celebrate this, but don’t let this be the best thing you do in life. You’ve got a lot more to do in your life. Let’s make sure this is something you learn from — learn from the characteristics of this team to go on and do greater things in life. I was so happy when we got in the locker room. Being with everyone, being happy because … we went through it. We fought together throughout the whole year. We did it. We figured what playing Villanova basketball for 40 minutes could get us. That’s what we did. The locker rooms cleared. Villanova headed to the downtown Royal Sonesta Hotel. And UNC went to the Hilton Houston Post Oak. Neither team would sleep that night. We didn’t get back to the hotel until like 2 or 2:30. They had a big ballroom with our fans. We had a little reception there with them and upstairs we had a secluded area where our family and close friends were. They shared the moment with us. I’m not sure how many people filled that ballroom. They showed us love. Nova Nation really did not sleep a wink that night. Celebrating with my teammates and getting embraced by my family was by far the best part. Just how proud they were. That meant the world to me. We got back to the hotel, and [I] didn’t think it was real that we lost like that. We were just talking about little things. About the season. About what happened. What we felt like once that shot went in, it was … a lot of stuff was going through everybody’s head. I hung out with my family and my parents. It was like 4 a.m. They ordered pizza and we just sat there and kind of relived the whole run. We were just up till 5 a.m., talking and talking. Talking about the game. Especially how it was for Nate. You know, Kris is his brother. We ended up trying to go to Whataburger or something … I think it was closed. It was one of those nights where nothing went right. Nothing’s going right. I didn’t think it was 5 a.m., but maybe it was. We rolled around in the Uber for 35 minutes. Everything was closed. I think it was me, Marcus, Nate, Justin, Brice and maybe Theo. We were in this big ol’ XL Suburban riding around. We were just so over it … We didn’t go to sleep at all. 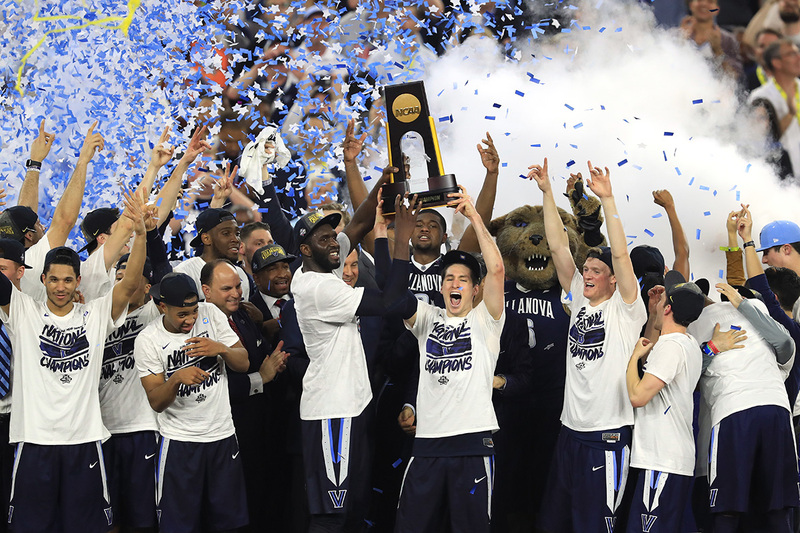 Daniel Ochefu (left) and Ryan Arcidiacono (right) hoist the trophy after the Villanova Wildcats defeated the North Carolina Tar Heels, 77-74, to win the 2016 NCAA championship at NRG Stadium on April 4, 2016, in Houston. Three months after the national championship, by himself in the basement of his childhood home in Iowa, Marcus Paige, still “probably too soon,” watched the game in its entirety for the first time. He made it to the halftime break, a point at which UNC had a 39-34 lead. He pushed through the game’s final 5:29 mark, when his team found itself down 10. He saw his shot. He saw Kris’. But what if Jenkins had missed? What if Villanova was on the other side of fate? It’s one of the best national championship games in history. I’ll probably have to show people my shot years down the road … I’ll be that old guy that’s talking about how I hit the shot that could’ve won, instead of actually showing somebody a championship ring. I’m sure Carolina fans will never forget it, and that’s good enough for me. To know that we gave it our all. Any time you have a walk-off buzzer-beater to win a championship, that’s pretty special. Kris’ shot is up there. You think of Jordan’s shot. You think of Lorenzo Charles’ tip-in dunk against Houston back in 1983 … I believe his shot will be there with all the rest. [In the future, I’ll say my] shot was Kobe Bryant-esque. Cold-blooded. But that’s 20, 30 years from now. Right now, it was just one of the many shots I shot, that I take every day. I’ve shot that shot a million times. You can’t get away from it. Any time they start talking about the tournament, boom, Kris’ shot is on. I’ve wondered what it would be like to be on the other side of that. I can’t even imagine. I don’t think about overtime. I think, What if it went the other way? Definitely the greatest ending of all time. I wish I was on the better end of it, but, it is what it is. Do I ever wonder if it went to overtime? I don’t wonder. I know what would have happened. We would have won. We wish we had that extra time. It never really crossed my mind. Ever. About what if that went to overtime. I don’t think what if the game went into overtime. Because it didn’t. All I can do is flash the national championship ring, and say we never had to find out about overtime, right? No one can take away the memories of that game. There was a bunch of what ifs … Over the offseason, it was motivation. To get back and change that memory. Grant Hill: NCAA analyst, Turner Sports; NBA analyst, NBA TV. Jay Wright: Head coach, Villanova ( top seed in 2017 NCAA tournament), 2016 Naismith College Coach of the Year, author of Attitude: Develop a Winning Mindset on and off the Court. Daniel Ochefu: Rookie power forward, Washington Wizards (undrafted in 2016 NBA draft). Ryan Arcidiacono: Rookie guard, NBA D-League’s Austin Spurs (undrafted in 2016 NBA draft). Mikal Bridges: Sophomore forward, Villanova. Josh Hart: Senior guard, Villanova, 2017 Big East Player of the Year and finalist for the Wooden Award, given annually to the most outstanding player in college basketball. Kris Jenkins: Senior forward, Villanova. Roy Williams: Head coach, North Carolina (No. 1 seed in 2017 NCAA tournament), 2016-17 ACC regular-season champion. Marcus Paige: Rookie guard, NBA D-League’s Salt Lake City Stars (55th overall pick in 2016 NBA draft). Brice Johnson: Rookie forward, Los Angeles Clippers (25th overall pick in 2016 NBA draft). Joel Berry II: Junior guard, North Carolina, 2017 second-team All-ACC. Justin Jackson: Junior forward, North Carolina, 2017 ACC Player of the Year and consensus All-American. Isaiah Hicks: Senior forward, North Carolina. Kennedy Meeks: Senior forward for North Carolina, 2017 ACC All-Honorable Mention. Theo Pinson: Junior forward, North Carolina.